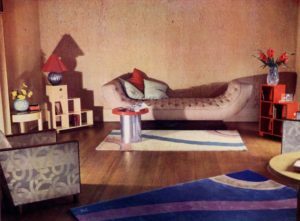 British furniture, textile and interior designer, Betty Joel was one of the few designers who assimilated modern aesthetics and produced a uniquely British response to the post-war needs. Her work in both furniture and textiles was distinctive for the use of curved lines and curvilinear shapes. 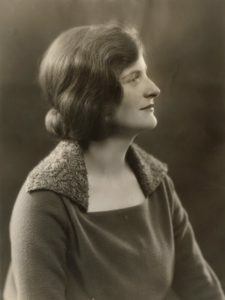 Betty Joel was born Mary Stewart Lockhart in Hong Kong in 1896. In her early twenties, during the years of the First World War, she remained in China with Sir James, learning about art. Betty moved to England after the war and began designing furniture in Portsmouth. 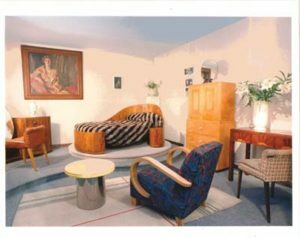 This design career began in 1921, springing accidentally from the need to furnish her modern home in a suitable style. She met her future husband, Commander David Joel, while he was in the navy serving in the Far East. Without any formal training, she started her own business Betty Joel Ltd. with her husband David Joel, with a furniture workshop. She began designing furniture, using the expertise of local artisans using traditional construction, oak and teak. In 1938, she created a studio for Lord Mountbatten’s Park Lane, London home and a bedroom for the 2nd Countess of Iveagh at Elveden Hall. Other commissions included work for Savoy and St James’s Palace Hotel, and for the then Duchess of York. With the breakdown of their marriage in 1939, Betty withdrew from the design world and did not work anymore. David Joel continued the business by renaming David Joel Ltd. She died on 21 January 1985, Hampshire, UK. What were her major works? Initially most of the furniture was made of teak or oak. This was known as “Token” furniture and the Hayling Island factory had the same name. Such was the popularity of Joel’s projects that in 1929 the factory moved to a larger location in Portsmouth. 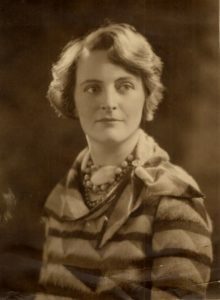 Many of the English social and business elites have commissioned Betty Joel to design interiors and furniture for their homes and offices. The desk in the picture below was part of a suite of furniture designed for the office of a Harley Street eye surgeon, F. A. Williamson-Noble. The curvilinear shape and the use of exotic wood veneers, with base and handles in contrasting Monel Metal (nickel-copper alloy), was typical of Joel’s style at the time. A good example of the curvature of the furniture is particularly applicable to the bed in the photo below. This bed was originally made for Lady Mountbatten and it is now in a private French museum. It is undoubtedly the single most important piece of furniture of the period between the two wars produced in Britain. The painting on the wall is a portrait in oil by Frederick Whiting, by Betty Joel, from 1929. Also, note the extraordinary modernity, evident in the round stainless steel table and the modernist rug. How can we identify Joel’s style? Having been raised in the Far East, Betty Joel, in an extraordinary way, became one of the few designers who assimilated modern aesthetics and produced a uniquely British response to the post-war needs. She brought with her the moderation and dignity of the best Eastern tradition from China. Influenced by the rich materials and clean lines of the French Art Deco furnishings, as well as by the functionalism and craftsmanship of the Arts and Crafts movement, Joel sought to create pieces that were beautiful, practical and finely crafted. 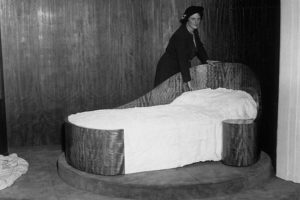 Betty Joel standing beside her revolving bed at the Royal Academy’s exhibition of British Art in Industry, January 1935. Her designs were simple and straightforward. Her work in both furniture and textiles was distinctive for the use of curved lines and curvilinear shapes. 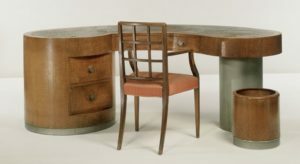 Joel set herself the achievable objectives of producing refined and practical furniture for the modern home and unveiled, however, modern lines that linked it to the Modern Movement. She was successful in introducing a version of modernity into a wider audience, albeit through a wealthy clientele, and later through other producers who imitated his style.